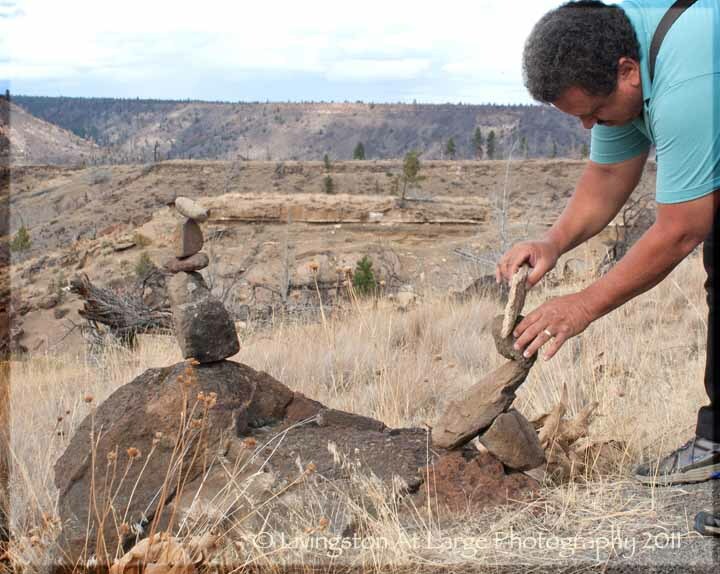 High on the list of Oregon odd stuff, the balancing rocks are unlike anything I have ever seen. They're the hardened capstones of an ancient lava flow. As the softer material erodes beneath the rocks, pillars that support them grow tall beneath them. At some point the rocks tumble off and this starts the repeating process, which can take 20,000 years so I would take your photo ops now. The most difficult part of this trip is not losing faith that you drove past it somehow…. 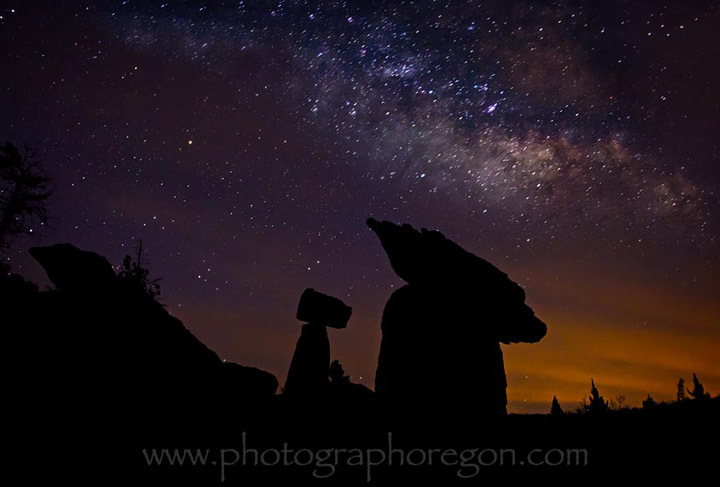 You drive and drive and then it seems like there is no way you are anywhere near the Metolius river (which the balancing rocks overlook) and then, there it is….Pay very close attention to when the road becomes gravel, or you WILL miss it. *NOTE* This last time we went out, the little trail sign was gone. These newest images are an update. As you can see it's a fine place to do some Night Star Photography. We went out to do some milky way shots. Should you want to do this, go out before dark and get situated so you don't fall down the mountainside trying to get the perfect location. We sat and waited for the dark and hooted back and forth with a Great-Horned owl. 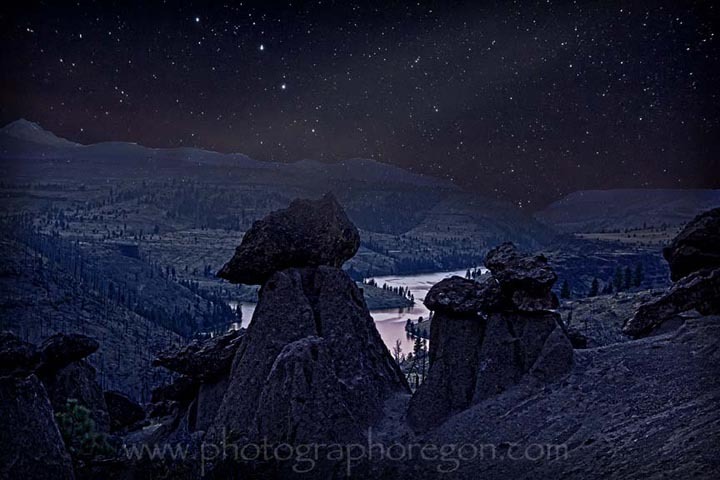 There was some smoke in the air from a large wildfire but the Metolius river still looked lovely in the star light. Daylight images, like the one below also require some scrambling down the hillside. But it's worth it. There are several ways to get to the balancing rock trail. We took the road across lake Billy Chinook, because we like it, but on the way home we took forestry roads into Sisters. I suppose if you’re a gadget geek, like my husband, you can just plug these GPS co-ordinates. N 44.57.523, W-121.42.348. Or you can follow the directions at the bottom. 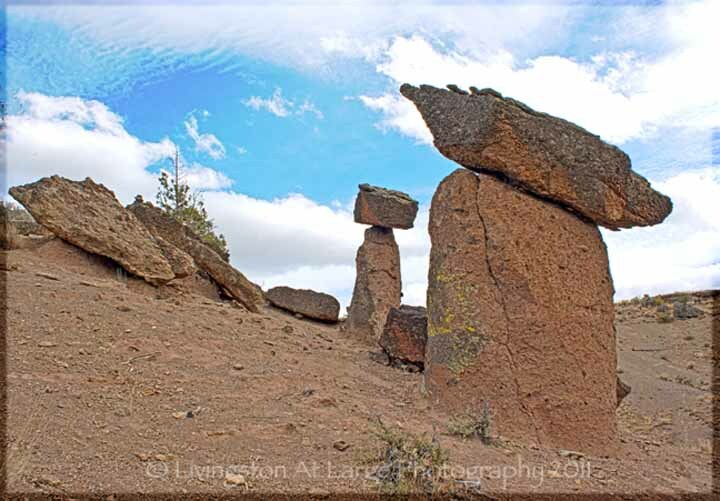 Once you get there, it is a very short walk to the actual balancing rocks. They used to be really hidden in the forest but in 2002 a fire swept through and made them visible. They quickly became a popular walking destination so in 2005 the Forest Service put in a nice gravel trail and a small trail sign. 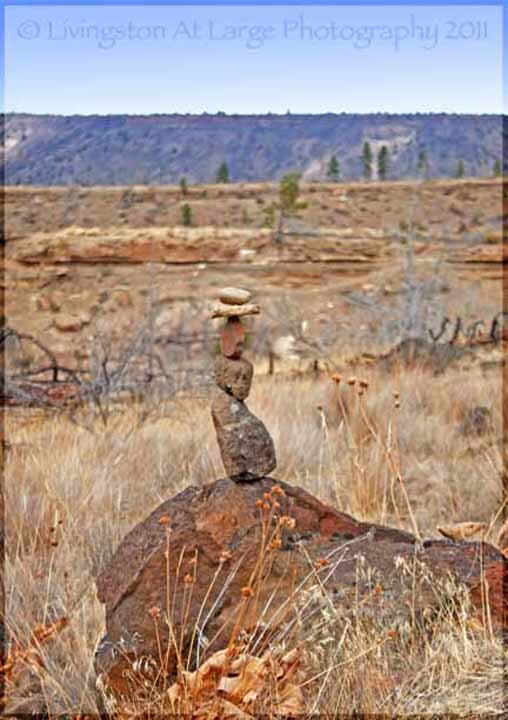 Now, people also stack rocks in various formations along the trail. My husband, Jerry, who is a very good sport but usually is obviously coming along to make me happy and because he likes waterfalls, really got into the rock stacking thing. He must have made 10 stacks. Now he does it on OTHER trails. So, if you are out somewhere and see some random rock stacking, we might have been there! From Central Oregon (Bend/Redmond) go north on hwy 97 towards Madras, after the scales turn at Culver following the signs to Cove Palisades State Park. 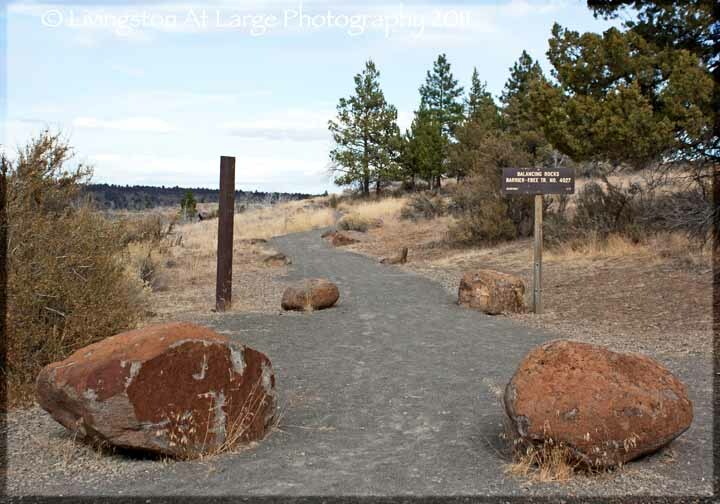 Drive west to Lake Billy Chinook and on through Cove Palisades State Park, following the signs for Perry South campground in the Deschutes National Forest. Stay on the road until it turns to gravel, yes, through the little tiny towns and everything…..12.2 miles past the second (Deschutes River arm bridge) that you went over on the lake, the single lane bridge. Keep following this road as it turns and makes its way around the mountains and passes through the ghost town of Grandview which is marked only by the cemetery gate. 0.3 mile after the road switches from pavement to gravel you will see a small turn out on the right. Turn in to it. Then you will see the sign. Right before you get there you will pass Forest Service Rd 1170 on the right. You can take this road in conjunction with a few others to get in to Sisters should you want to go back that way…..but use your GPS.